Trauma has hit the headlines this week, following the tragic incident involving cricketer Phil Hughes. Hughes, a batsman for the Australian side, was knocked unconscious and later died following a knock to the head by a high-speed cricket ball during a game in Sydney earlier this week. Traumatic brain injury in sport is a very serious issue with potentially life-threatening consequences, as this incident has once again highlighted. Mr Doug Hammond, a doctoral research fellow and maxillofacial surgeon from the SRMRC was interviewed on the day of the accident and said, “Whilst concussion has received more press with regard to specific incidents in rugby and football, players with head injury in cricket is not a new thing. “For example, Phil Simmons from the West Indies had to undergo neurosurgery as a result of his injuries following a strike to the head by a cricket ball in a match against Gloucester during a tour of England. “It’s quite clear that Phil Hughes has had significant head injury given the reports of mouth-to-mouth resuscitation and being medically induced into a coma. Hopefully he will recover soon.” Sadly Hughes passed away later in the week. However, it’s not only the big hits that cause harm. Even relatively small knocks to the head can have serious outcomes, such as concussion, which is another issue undergoing much debate within the world of sport. The SRMRC is at the forefront of this debate, and are conducting research which will help to inform sports players, doctors, and coaches about the risks of concussion, alongside developing methods for diagnosis and treatment. 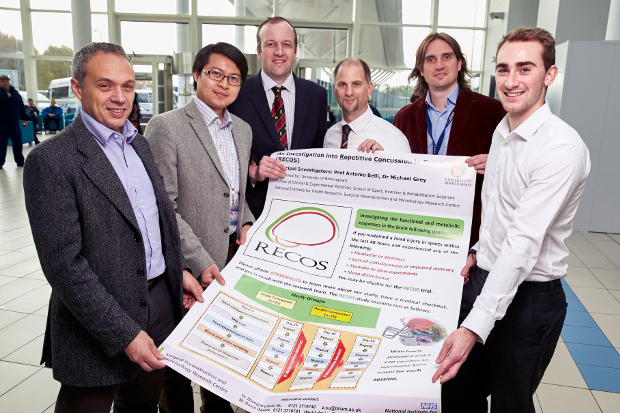 In fact, members of the team are currently undertaking the UK’s first clinical trial (named RECOS) into the functional and metabolic responses to concussion in sports players. The team are giving a series of talks about concussion and the RECOS study from 18:30-20:30 on Monday 8th December in the School of Sport, Exercise and Rehabilitation at the University of Birmingham’s Edgbaston campus. Speakers include Professor Tony Belli, Dr Michael Grey, Mr David Davies, Dr Zhangjie (Jack) Su, and Mr Doug Hammond (pictured above). More information about this event is available by clicking here. The event is currently sold out, however please check back regularly as more tickets may become available.